Happy JUNE everyone! Can you believe that it's nearly halfway through the year and summer has (un)officially started? Time seems to be flying by lately and I've been so busy lately, that I almost forgot about today's linkup! 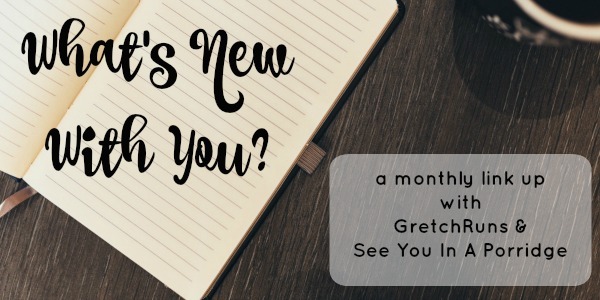 That's right...it's already time for the monthly linkup with Kristen and me. Make sure you link down below and tell me what's going on! Do Something Crafty. I didn't do so well with this in May. I was really busy with work and other things (see below) so this kind of got pushed to the side. In June I really want to sew something- maybe a dress or cute top for summer. Be Musical. I got a few new piano books, and they're really challenging me! I can already tell that I'm improving a lot, and the music is really fun to learn. I've been using this as a way to de-stress at the end of the day, and I'm loving it. The books that I got are 100 of the Most Beautiful Piano Solos and Harry Potter. In June I hope to play the saxophone and violin more, but also keep working on the piano. Stay Active. This was definitely an active month for me, both with training and other activities. I have two races coming up in June that I'm really excited about and have been training hard. I've also been spending a lot of time at different parks with Dan and Selma hiking and going to dog parks, and doing a lot of yard work as well. I've been staying busy! During REI's big semi-annual sale, we also decided to get roof racks for our cars so that we can buy kayaks and stand up paddle boards. It's something that I've always wanted because I love being on the water so much (and we live a few miles from a beautiful lake), so I'm hoping to get out there soon. Drink Beer! I went to one new brewery in May- All Saints Brewery in Greensburg. It was a really neat place with an amazing flight (all of their beers on tap- 10!- for $11). I'm hoping to try out at least one in June, and also have plans to go to a local winery and whiskey garden as well. We got our first CSA box. We'll be getting these weekly until November, and I'm already loving it! In our first box, we got two types of lettuce, spinach, rainbow Swiss chard, radish, herbs, rhubarb (which I've NEVER tried), and a fresh loaf of bread. If anyone has ideas on how to cook/eat rhubarb please let me know, because I have no clue what to do with it! I love the sunflower dress! The only thing I know to do with rhubarb is put it in crumble - and I've only ever done that with tinned rhubarb! So if anyone gives you any ideas for your fresh rhubarb I may just have to steal them ;-) I've never bought the fresh stuff because I have no idea how it's supposed to work! I can not believe it is June already but then again I said that about May too! I would love to see your sewing projects if you get some done! All those veggies look delicious! And that sunflower dress is adorable! I love that! Good to know it lasts until June 4!! I had no idea! Thanks. AH - 10 beers for $11!? That sounds awesome. And I love that I wouldn't have to pick which ones I wanted to try! Rhubarb is kind of an odd duck. It works really well to be sweetened A TON and added with apple or strawberry to make a dessert of some sort. Like Strawberry rhubarb pie, or you can cook it down and make apple sauce with it. It's texture reminds me a lot of celery, it's kind of stringy and tough if you don't cook it down. Kayaks are fun! I've never tried SUP-ing though. I think I'd like that better than sitting down in a kayak. My grandma used to make rhubarb pie and I think that's the only time I ever really ate it. I want a piano so bad! We had one for a few years growing up and I never learned to play. I've always regretted it and want my kids to learn. I think that's the perfect way to unwind! I'm just window shopping the Nordstrom sale too. Boo. Haha! All I know about rhubarb is that people make pies with it? Haha! Those leggings from the sale are super cute! I love how one of your plans is to drink beer! Summertime = a cold one! Harry Potter soundtrack music is awesome- that's so cool you're learning to play. Kayaks and SUP sound like fun! I love the Harry Potter soundtrack!! To play the piano more is on my list of goals every month but I'm really hoping to make it a bigger priority this summer - The Harry Potter soundtrack sounds really fun! We used to have a CSA near me and I never jumped on board and now it's gone! 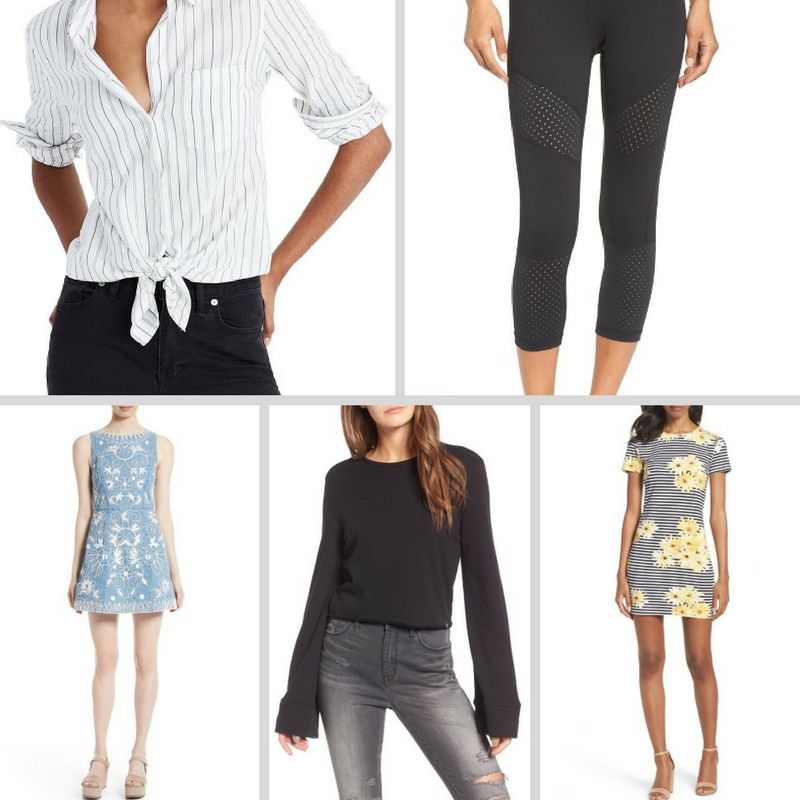 Love those leggings - I have heard so many good things about ones sold at Nordstrom but I have never bit the bullet to try them. Playing music from Harry Potter sounds awesome, and your CSA box looks full of good things! I, too, am getting ready to purchase a kayak! I love to white water raft, but unfortunately the closest white water is 5-6 hours away. Kayaking isn't the same, but it's a good 2nd best. I'm just happy to have the opportunity to be back out on the water on a more regular basis. Oh my gosh, looking at all those fresh veggies makes me realize I really need some greens in my life, I haven't been too great at eating healthy...Happy Summering! You can also have it stewed, I think it's quite good with ginger in it, served with yoghurt. Or you can make a fool out of it (I think like this? http://www.bbc.co.uk/food/recipes/rhubarbfool_71270) which is quite good if you're not a fan of the stringy texture. And if you're having crumble don't forget the custard!! That CSA stash looks amazing! I've always wanted to try that but my area options are so expensive! I love CSA shares! Since I'm only one person I find it's usually a bit much for me :( Instead I try to hit up the market each week to get local produce.